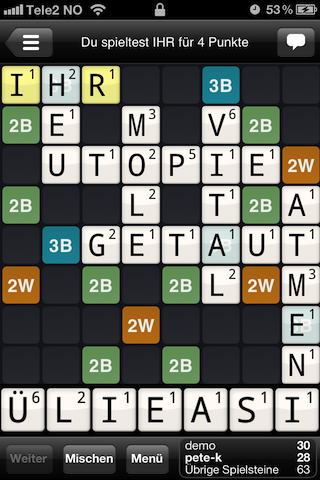 Wordfeud Update featuring German dictionary! 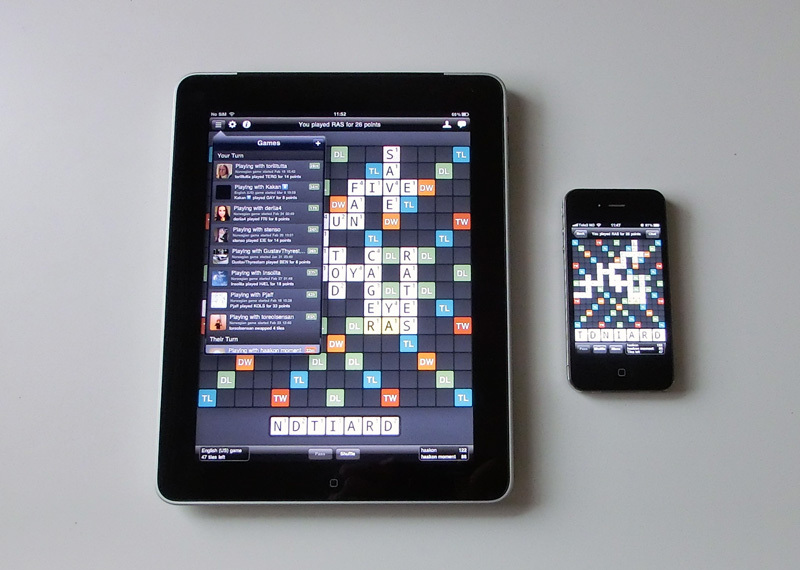 We’ve just released new Wordfeud updates for iOS, Android and Windows Phone 7. The biggest news in this update is that we’ve added a German dictionary. We’ve also translated the user interface to both German and Norwegian. If your phone’s language is set to one of these languages, then you’ll automatically get the translated user interface. 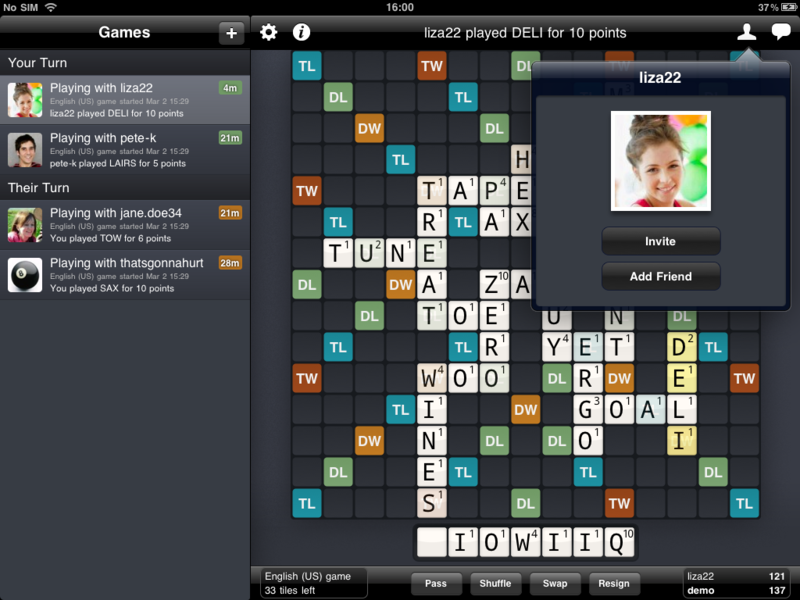 The current Wordfeud version has some annoying bugs that affect users playing on the iPad. Tiles can be hard to pick up from the rack, and the game list may appear when a tile is picked up when the iPad is held in the portrait orientation. This is caused by some changes Apple made in iOS 5.1. It also causes Wordfeud to crash if attempting to remove finished games. There’s also a memory leak that affects users playing on the iPhone. The game board may turn black after playing a while, in which case it’s necessary to restart Wordfeud. We’ve submitted an update to Apple that fixes these problems, and expect it to be out either late this week or early next week. The update also includes new high resolution graphics for the new iPad. Update: Apple really came through on this one and did a very speedy review, so the update is now available in the App Store. 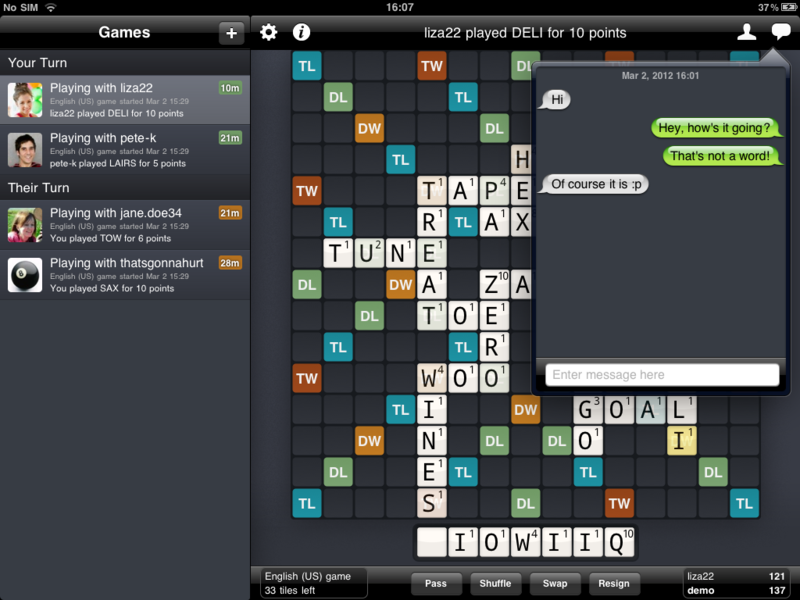 Wordfeud for iPad is out now! Wordfeud for iOS v2.0 has just been released! New in this version is full iPad support. Of course, it was always possible to play the iPhone version on the iPad. But it didn’t look very good, and it didn’t take full advantage of the larger screen surface and increased resolution of the iPad. This update fixes that, with support for both landscape and portrait mode on the iPad. If you’ve already installed Wordfeud on your iPad, just do an update from the App Store application to get the latest version. Bought Wordfeud on your iPhone and installing on your iPad for the first time? You don’t have to repurchase Wordfeud. Just open the settings (tap the cogwheel button), and then tap “Restore Previous Purchase”.